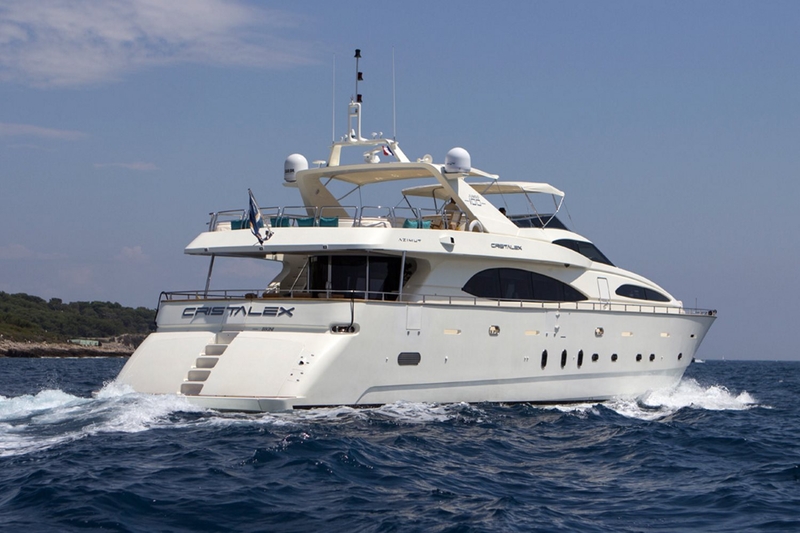 Motor yacht CRISTALES is a 30m (100ft) Jumbo Azimut charter yacht as launched in 2006. 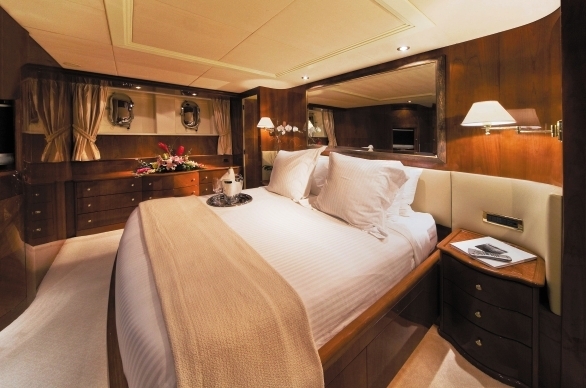 She sleeps up to 8 charter guests in 4 cabins and can cruise with 12 passengers. 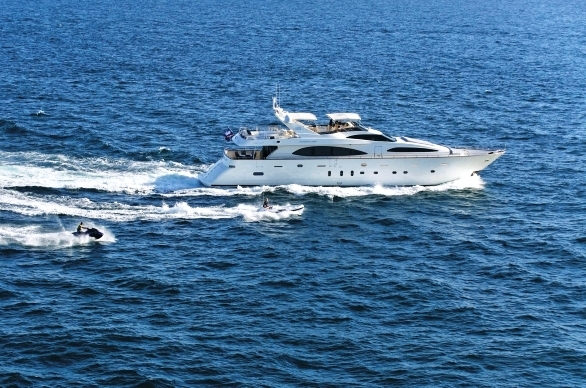 CRISTALES is an Azimut jumbo with her garage of superyacht toys is one of the finest charter yachts available today with two master cabins and two equal twin cabins, ample deck space for sunning and a large area where guest can relax under cover all near the large Spa Pool on the flybridge. 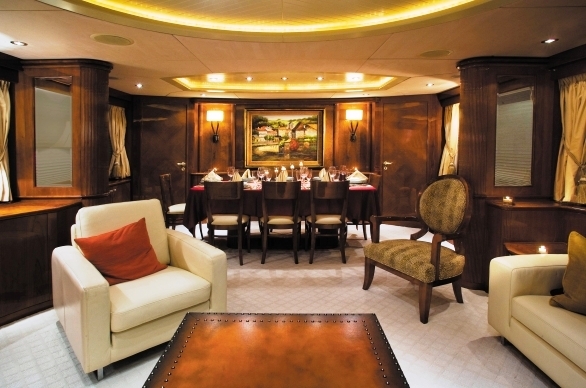 The interior decor is elegant, with high gloss wood panelling, neutral furnishings and exquisite marbles throughout. 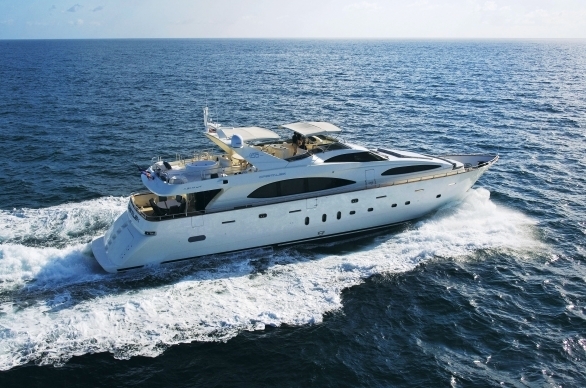 The main salon contemporary styling is laid to an open plan, with the lounge and wet bar aft, and for al dining forward. 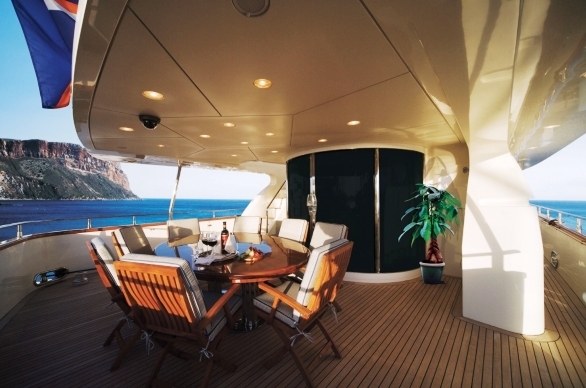 Surrounding large windows ensure optimal natural light and great views. 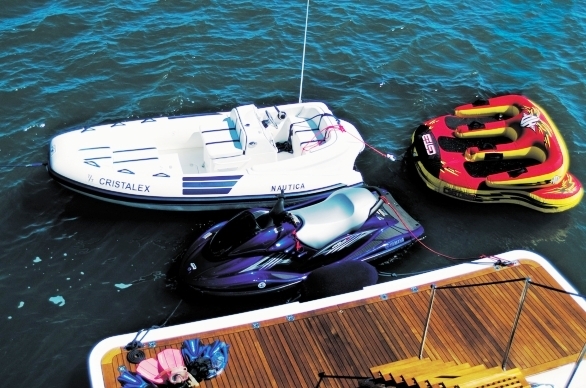 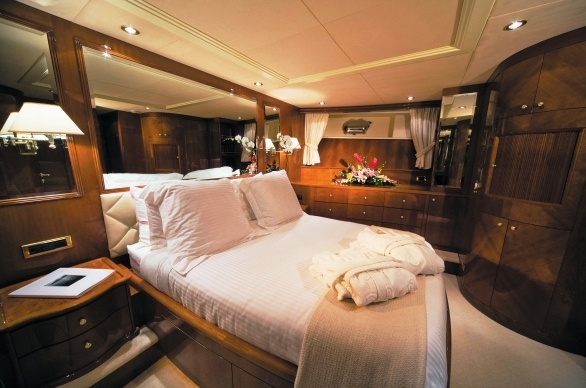 The accommodations offer two twin cabins with ensuite bath facilities as well as two master cabins that we refer to as the Master and the VIP the master having His and Hers facilities. 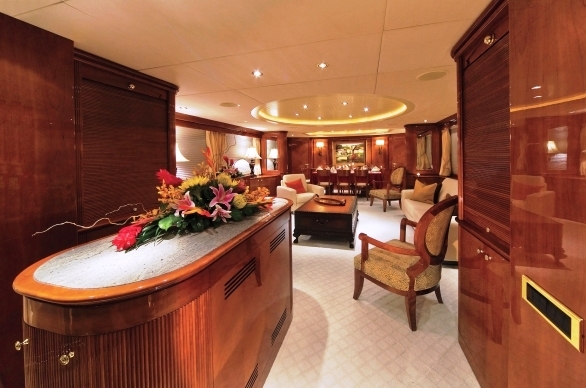 While the VIP although large has also ensuite facilities. 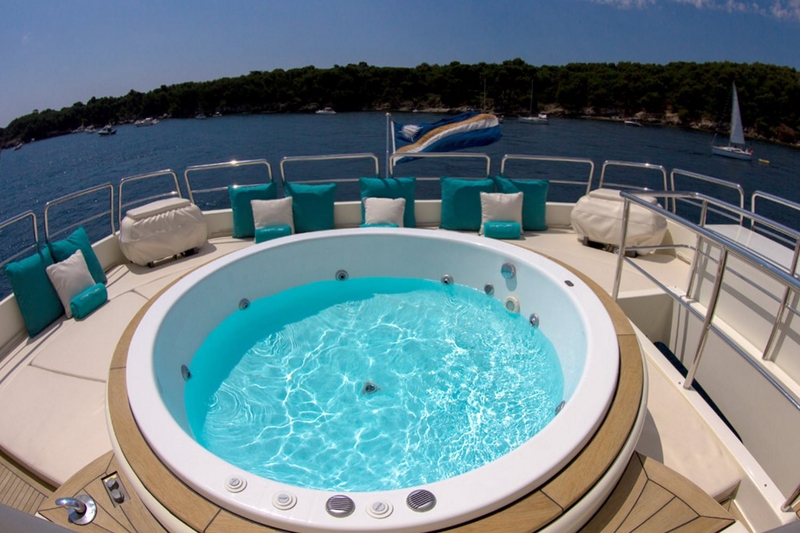 The two twin cabins are extremely comfortable and each not to be outdone by the Master and VIP, also have marble countertops and large showers. 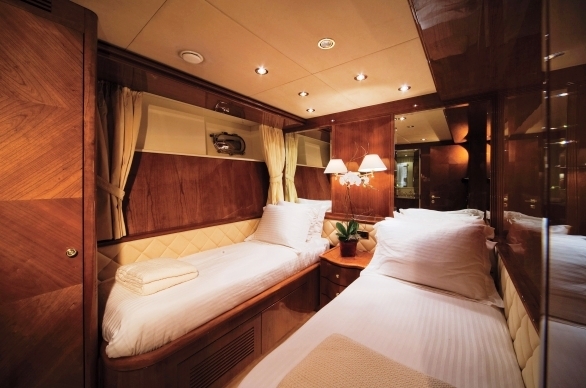 With nighttime reading and under bed mood lighting, they are, to say the least, comfortable. 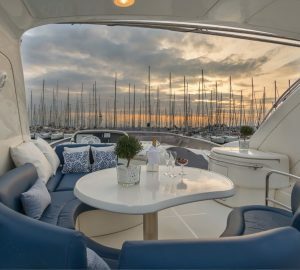 Her deck areas include a generous shaded aft space with alfresco dining, access to the salon, upper deck, foredeck and swim platform. 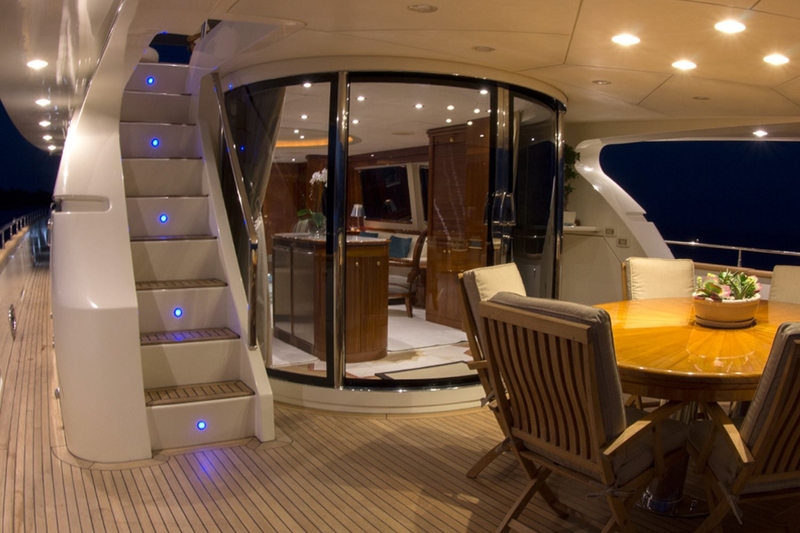 On the foredeck is a large raised sunpad. 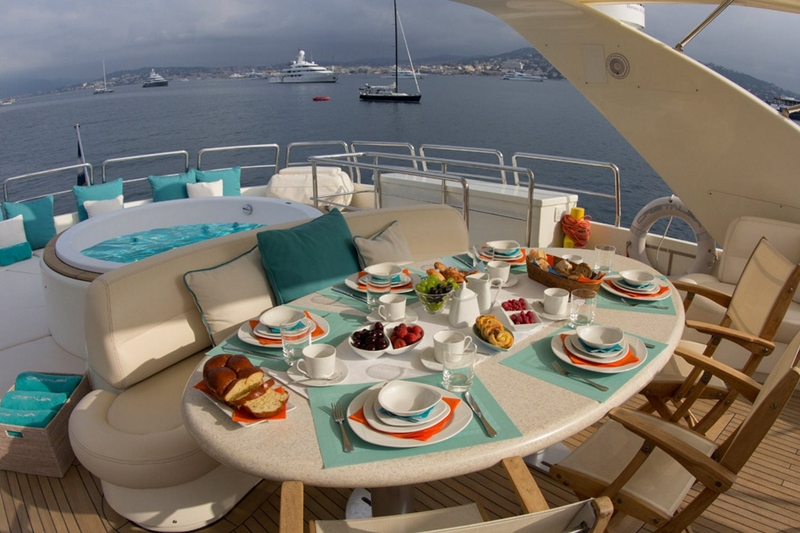 The upper deck has partial shade, a Jacuzzi, sunpads and additional alfresco dining table. 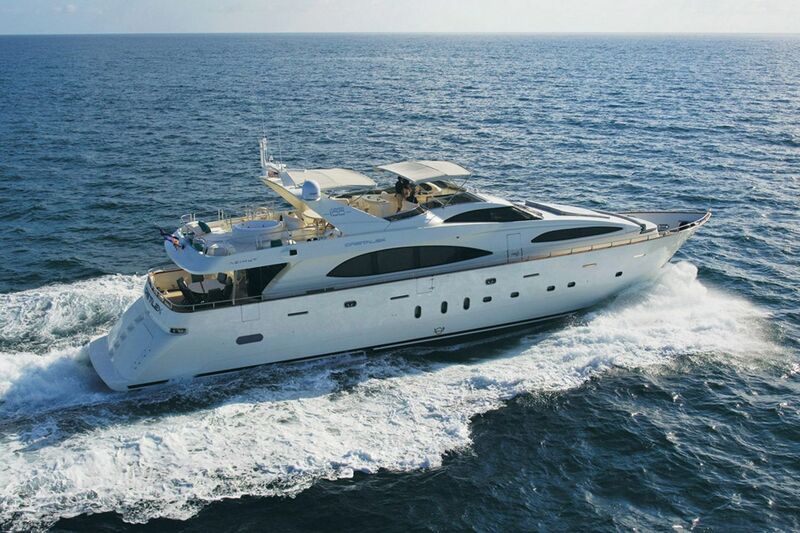 Powered by 2 x MTU 2000hp engines, CRISTALES has cruising speeds of 22 knots and top speeds of 27 knots. 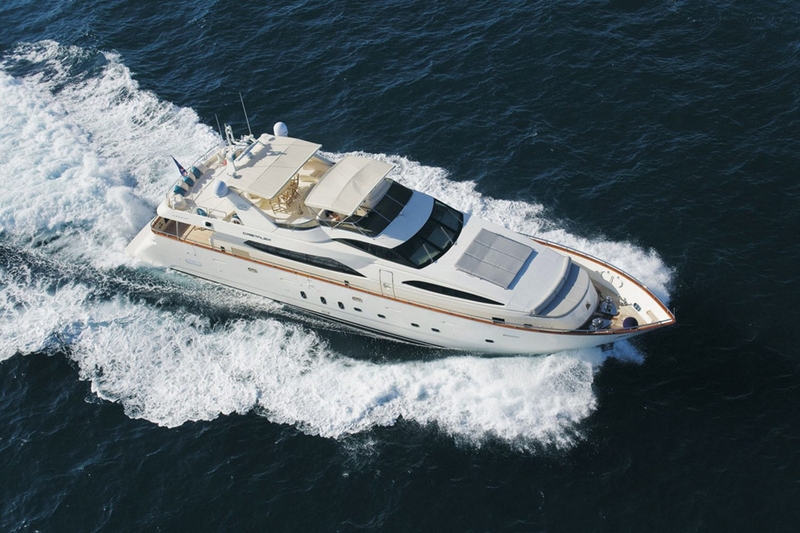 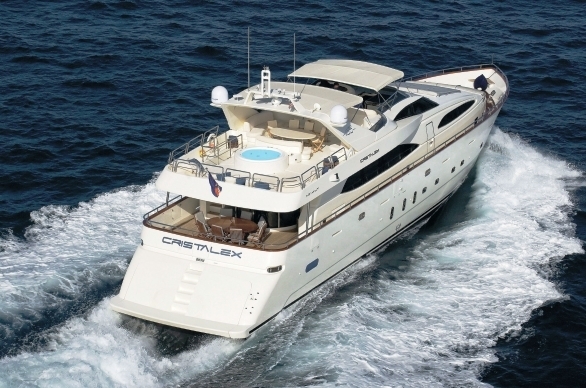 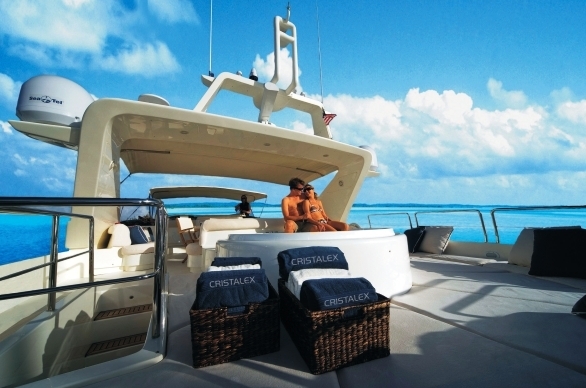 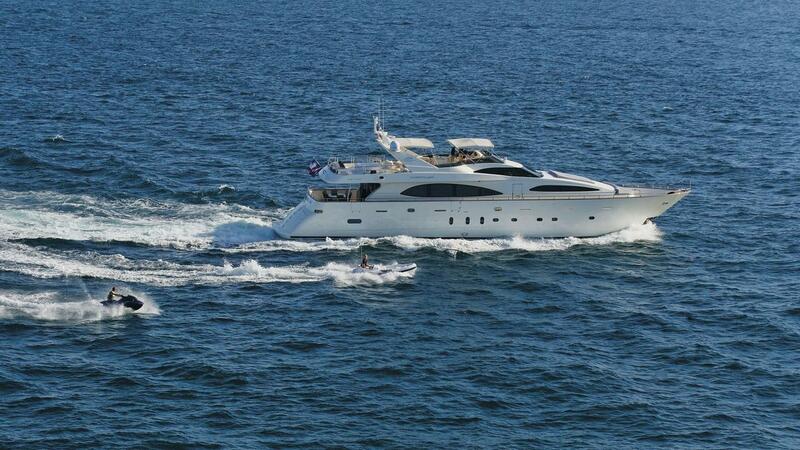 The Azimut charter yacht CRISTALES can accommodate 8 guests in 4 individual staterooms. 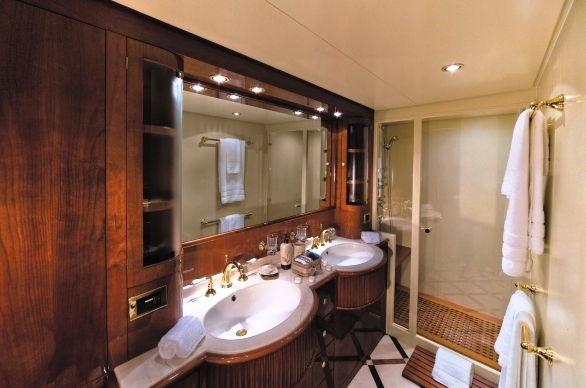 Her Master cabin has his and hers marble shower facilities, her VIP cabin has a marble ensuite and her 2 Twin cabins also have marble ensuites. 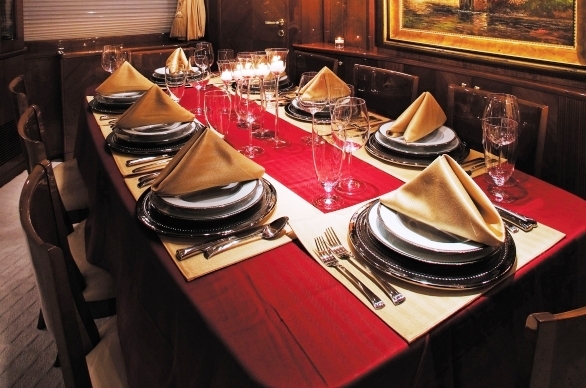 Each cabin has TV and hi-fi and all cabins are located on the lower deck.